In these increasingly fragmented times, it's important to bring people together – which is why for our second tour of 2017, we've brewed up all-star bill of three comedians, from three different continents. Performing across Dubai, Abu Dhabi and Doha in February will be three of our favourite stand-ups on the planet: consummate Canadian Peter White, British-Nigerian sensation Funmbi Omotayo and high-octane Aussie A-lister Damian Clark. Each having achieved widespread fame in their own countries – and beyond – this bill represents a stunning snap-shot of the diverse state of stand-up today. We reckon there's nothing better than comedy to crush barriers and break ice – seriously, who doesn't enjoy a laugh? – so if you're hunting for some much-needed proof that we can all rub along together in these most trying times, come and have a cross-cultural laugh with us in February. Take a closer look at the trio of stand-up talents performing across the GCC as part of The Laughter Factory's February tour. Damian Clark is what you might call a “comedian's comedian” – a man with friends, and fans, in very high places. 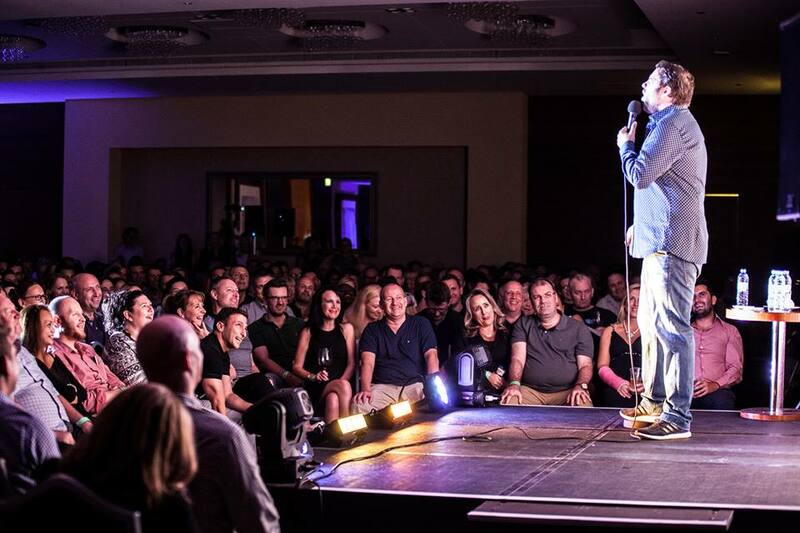 These include Kevin Bridges, who hailed Damian as “infectious, hilarious and highly recommended,” and Jack Dee, who assessed this raw, rambunctious comedic talent as “mad as a box of lights”. Currently based in Ireland, Damian has roundly conquered his adopted home, with featured slots on RTE's Republic of Telly, TV3's The Apprentice: You're Fired!, as well as writing and co-starring in Ireland's highest-ranked sitcom, I Dare Ya! But performing live, he is at a whole other level – uncontrollably exuberant, in-your-face and taking no prisoners, Clark needs to be seen, and heard, onstage to be believed. You have been warned. It's hard not to love Funmbi Omotayo's relaxed, charming delivery. Calm, collected and always in control, this London comic spins out stories with a gentle pace and friendly face which can melt the coldest of comedy hearts. Winner of the Leicester Square New Comedian of the Year competition in 2012, Funmbi was launched onto the national consciousness soon after with a slot on the primetime John Bishop Show. His star very much in ascent, last year Omotayo made a strong showing with his Edinburgh Fringe debut, a lauded solo show entitled Legal Immigrant which told the tale of his family’s move, following their roots from Hackney to Lagos... and back again. Sprinkled with a warm wit and insight, Omotayo opens up about his youth in East London, working in Harrods and discovering his African identity. With a disarming delivery and perfect pacing, Funmbi has proved TV comedy gold, bagging slots on Comedy Central At The Comedy Store, Sniggers With Attitude and MTV's Tramadol Nights. You might also recognise Funmbi from I'm a I'm a Celebrity...Get Me Out of Here NOW!, where the comedian broke down the day's onscreen action alongside Joe Swash. Within a year of picking up a mic, Peter White was recognised as one of the “Top five upcoming Comedians in Canada” by national CBC Radio. That was back in 2005, and over the past decade White has more than lived up to the hype. Known for a slyly self-deprecating stage shtick, exploring the funnier facts and mundane moments which make up the life of a 21st century man, Peter is established as one of the most enduring comics working today. Following his surprise breakout, White was quickly established as an A-list club comic in his own country, and soon went on to headline all Canada's major festivals – including Montreal's prestigious Just For Laughs and three consecutive years at the Halifax Comedy Festival – and in 2010 taped an hour-long stand-up special for CTV and Comedy Network. Since taking his gag reel across the pond to the UK, White has earned a place on the top of London's competitive club scene, and filmed slots for Comedy Central’s Comedy Store Live. With an acerbic, fish-out-of-water style, Peter has proved a hit on previous Laughter Factory tours, and knows exactly what he's letting himself in for.